This new standout volume is the first to describe developmental areas associated with social competence and social communication, as well as provide evidence-based information on effective assessment and intervention for children who have problems with social communication and social interactions. Expertly crafted, the volume offers both theory and practice within one comprehensive, yet manageable resource for busy professionals. 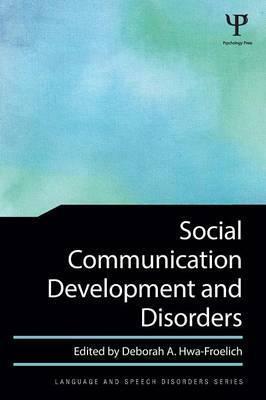 The first section covers social communication theory and associated developmental domains. Case studies are provided to exemplify how different variables may affect social communication development. The second section covers evidence-based practices for social communication disorders and includes case studies, incidence and prevalence estimates, the current DSM-V definition of the disorder, referral guidelines, recommended practices of assessment and intervention, and a list of clinical resources. Social Communication Development and Disorders" is an ideal text for a range of courses in Communication Sciences and Disorders or Speech-Language Pathology, and a must-have reference for professionals working with children with social competence or social communication problems, including speech-language pathologists (SLPs), regular and special educators, psychologists, and support personnel such as social workers, counselors, and occupational therapists.